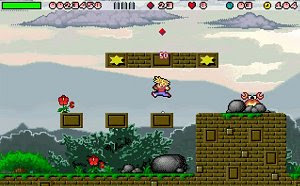 Giana’s Return aims to be a worthy UNOFFICIAL sequel of “The Great Giana Sisters”. There is an official sequel for Nintendo DS named “Giana Sisters DS” ( http://www.giana-sisters.com/) and also has slightly more levels than Giana’s Return. In other words, it’s worth the money. It’s very important to us, that you don’t mix up both projects – Giana’s Return is UNOFFICIAL and FREE – Giana Sisters DS is OFFICIAL and COMMERCIAL.